If you’ve caught up with the Project Worthwhile Life, then you’ll know I’m changing direction. Getting back in the swing is more like falling off the swing, hoping there’s a safety net somewhere. Or ricocheting off the roundabout onto a new swing entirely. I’m a bit nervous, and a bit scared, both good things to be when you’re embarking on a new adventure. It remains to be seen whether I fall on my feet or my arse! 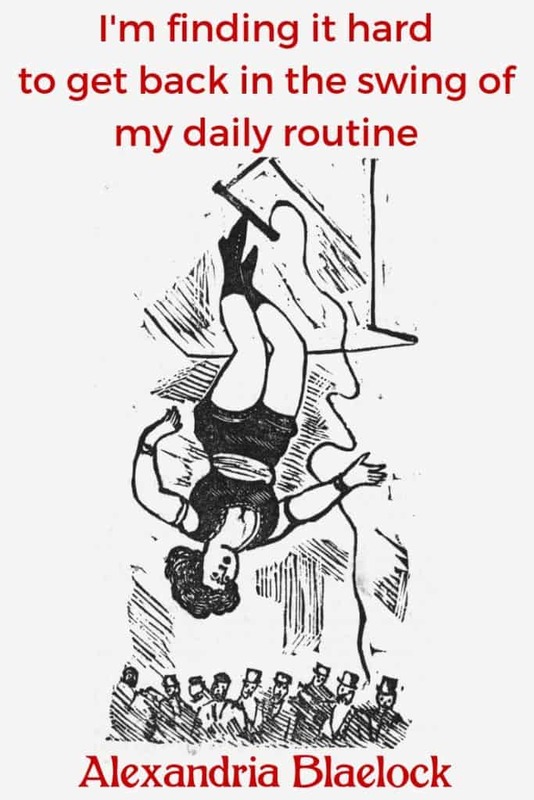 Mademoiselle de Montmorencey (Jane Gibb) as she falls from a trapeze swing, Dunedin, New Zealand. Police News 14 April 1877 via State Library Victoria. See more of my Haiku here.